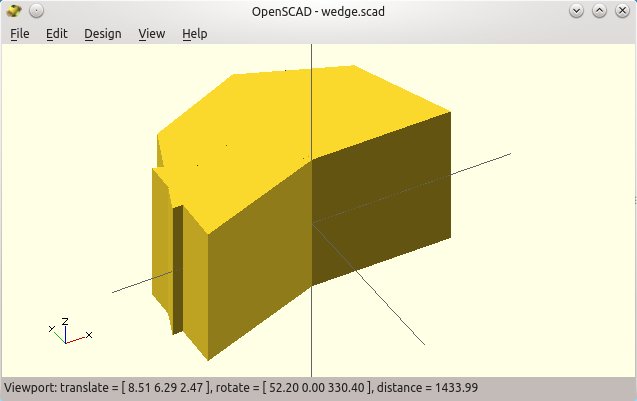 3D printer improvements: How to use Openscad (3): iterations, extrusions and more modularity! The "for( x = range ) block;" repeats the block once with x set to each of the given values in the range, just like if Openscad was automatically copy/pasting the command block. So what goes on here? 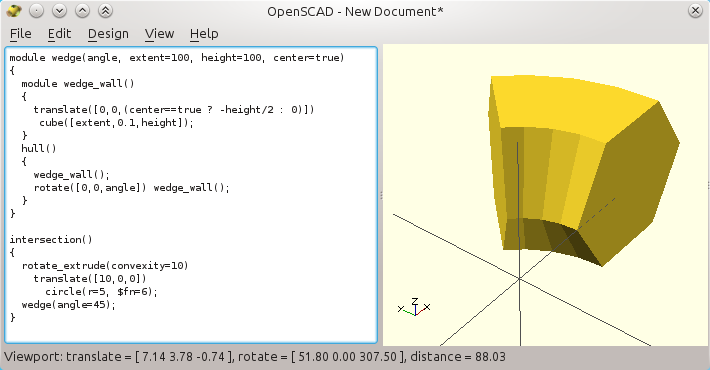 Openscad sets x to the first value of its range -10, then it does the same with y (to its first value, -10 also). Then, within the inside loop, it does a translation to (x,y) and adds a cylinder there. Once done, it loops with the second value of y (it sets y to +10), and adds another cylinder at (-10,10). When it reaches the end of the y range, it loops on x next time, with x=+10 and so it does again a loop on y=-10 and again with y=+10. Overall, the inner cylinder will be created once for each of the four locations! Hence the result looks like exactly like previously, but without the repeated code. This writing is more compact, and it helps to convert the source code to a more compact and parametric version: indeed, the size and roundness can easily be made variable now, and be set once at the beginning. I would write it this way, to minimize the presence of the hardcoded value "10". The idea really is to put 4 cylinders around the vertical axis at the same distance. This distance should be seen only once for more readability and easier parametrization. See how the remaining of the code becomes both generic and more readable with these refinements? cube(cube_size); // ...in a variable, used to create a cube! The "for" loops handle vectors of any size like [v1,v2,v3,v4], but we can benefit from a few additional variations, in order to improve the 4-cylinder example further. Less code almost always means less bugs: a range can be specified as a list of values as above, but it can also be defined by a [start:step:stop] triplet. This is done below, where r is set in turn to 0, then 90, and finally 180. We stop "at" 359°, i.e. before reaching 360° as it would be at the exact same place as 0° (and hence it would create a second, useless, cylinder there). To do so, we use variable "r" to rotate around the Z axis below. Then, the column seemingly positioned at (10,10) is in fact "rotated" to each of the four symmetrical points around the (0,0) central axis. There are still other ways to create the same design (eg. by intersections, and so). I tend to prefer either rotation, or inverted axes (with the scale operator and -1 on some axes). Actually, translating as we did above is probably not the wisest choice, because it does not change the "orientation" of the duplicated object itself. No biggie for a rotation-invariant cylinder, but you see below the issue with a shape that is no more a cylinder. Translations will keep the same orientation for the four parts! Rotation is often preferred as it also "fixes" the orientation of the duplicated part. But scaling operators also are useful to invert axes (click to see the code). If you recall, we use curly brackets to group items together, so that a modifier like translate shifts more than only the objects that follows immediately. You must also keep this in mind with for loops. The loop variable (like r,x,y above) are usable only within the so-called "scope" of the loop, which is "below" in the hierarchy. No problem when only one operation follows, as in the former cascade of loops. cylinder(r=t,h=t); // concentric cylinders depends on "t"
// It failed because openscad ignores blanks and indentation. cylinder(r=t,h=t); // fails! "t" is unknown at this stage. cylinder(r=t,h=t); // now OK ! // "t" is usable only in the *scope* of the for loop! Some seasoned programmers use braces all the time, even when they are unneeded. It makes the source code a little longer, but it makes it more consistent. More importantly in my opinion, it lets you add statements later on, without the need to alter existing code -- like the echo above. 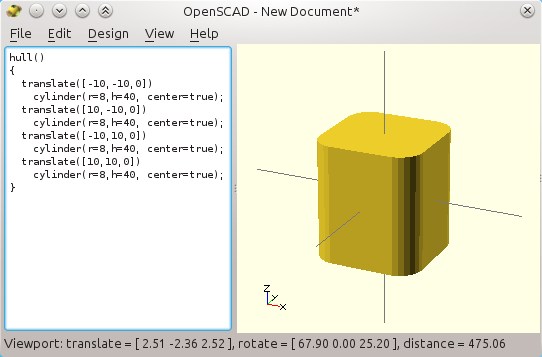 Only the latest version of Openscad made recursion possible. Previously, variables had the amazing property that they were ... constant! Advanced operators like "assign( )" helped circumvent some of the issues, but they made the source code even worse in my opinion. What is recursion? Well, it happens when a module calls itself in order to build more versions of its own shape, smaller or in another place. To avoid looping indefinitely (and killing the computer memory and CPU), we must also introduce conditionals. A test will be made to stop calling ourselves after some condition is met, e.g. like when the part becomes too small. Remember the mug-with-a-cup that we made in part two? Here is how we can write a recursive mug, that will add smaller-mugs-in-mugs till it get smaller than the constant wall width. It would not make any sense to go "deeper" in the recursion anyhow. By the way, you see also the use of the "color" operator, that highlights each of the sub-mugs. The color components were chosen according to the size of the mug, so we get an automatic color gradient whatever the depth of the recursion. if(width > wall_thickness*2) // only if there is room! If you still get only one mug, check the console for an error like "WARNING: Ignoring recursive module instanciation of 'difference'.". 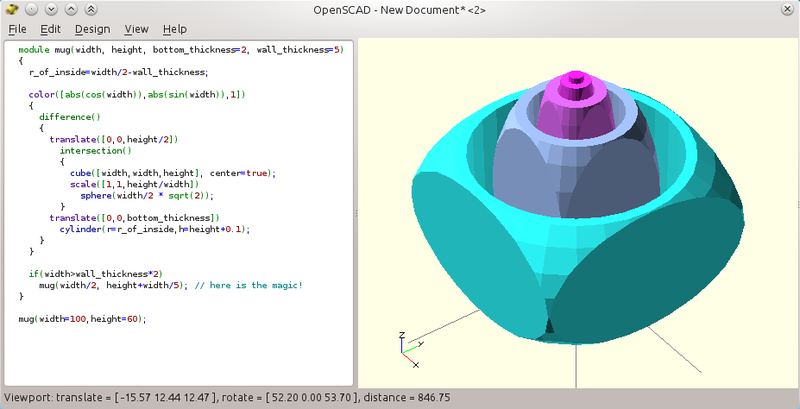 This would tell that your version of Openscad does not support recursion and that you should probably upgrade. In the "Help / About" menu, check that the version is more recent than the 2014.01.29 (e.g. the 2014.04.02 as above). 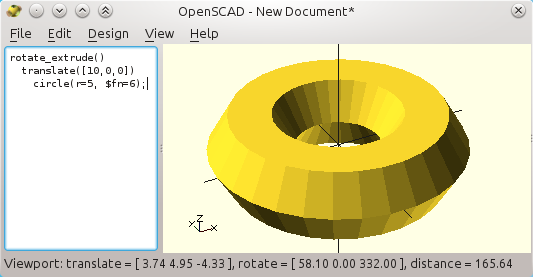 Important note: the very weird properties of variables in Openscad will not be discussed here. Even though recursion was recently allowed and not discussed in the following document, I highly suggest reading this detailed presentation of variables when you need it, written by +Stephanie Shaltes. By the way, she regularly posts about advanced subjects in Openscad so she may be interesting to follow on G+. The minkowski operator is quite cool. But it is so slow that we almost never use it. The effect is like when a shape is used to paint or "brush" a parent shape: e.g. a small sphere will "round" all the edges and surfaces of a given reference object. Shown below is an example where we use only 2D shapes, that Openscad also supports (we then use square in place of cube, circle for spheres and so). The minkowski operator, illustrated here on 2D Openscad shapes. It does works in 3D also but is so slow that the shape is usually better designed otherwise. More importantly, there are also two kinds of extrusions, linear and circular, that makes 3D shapes out of 2D shapes. They are very useful to create 3D shapes out of "industrial" 2D designs (often based on the Autocad DXF file format that Openscad knows how to import). Contrary to the linear extrusion, the rotate_extrude( ) operator can be used to create a "ring" out of a 2D profile. This is how we extrude a rough circle into a torus (note how the circle must be translated out of the origin to do so!). For the most curious readers, these extrusion operators have trickier optional properties (see the official documentation for more on this). If you cut the toroid by an orthogonal plane you will find the 6-segment primitive circle (hence the rough look). One annoying thing with the "rotate_extrude( )" is that it does not allow partial rotations. It will always "close the loop". and a big cube that stands in the positive (X,Y,Z) spatial quadrant. Now, for any angles smaller than 90°, we can create a "wedge" shape by means of a convex hull around two very thin slices (almost flat cuboids), where one of them is rotated by the expected angle (see, by the way how modules can be defined within modules). A 45° "slice" of the initial torus, but it works only with for small wedges. The "wedge_wall" thickness should be chosen below the 3D printer resolution, e.g. as low as 0.02 mm. But take care as too small a value and Openscad may just "skip" the shape!). You may have seen the use of the weird expression (center==true ? -height/2 : 0). This is a compact form of a conditional, usually barely readable: "if center is true, then replace the expression by the value -height/2 else use the value 0". This is a short way to code a condition, which is used here to shift the part downwards by half the height in order to center it, like it is done with cylinders. We did not use a more usual "if" test, as in the recursive mug. It would make life harder as "if" works with shapes, and not operators: the "if" condition cannot apply on the presence of the "translate" operation itself, but only on whole shapes. The "?" shorter version applies only on mathematical expressions, suitable here. All in all, in some case we will ask for a translation of (0,0,0), which works! Anyhow. The above wedge design fails when the angle is larger than 90°, as the hull will flatten the two-wall wedge (see the animation below). last "wall" fails with any large angles! We will see Openscad animation later. To create a pseudo-wedge that really can span 360°, we can use a succession of hulls no bigger than 45°, and that are progressively rotated around the Z axis. So using a loop is very natural to generate the intermediate walls, spaced here at 45° of each other. Still, we need to add the last wall "manually" as it may not fall on a multiple of 45° as below. Angularly-spaced thin wall to help building the required concave wedge. But a regular hull( ) around the thin walls would fail badly, as it would "fill" also straight from the first wall to the last wall. The required concavity made by the first and last walls would not be respected. Sure, as the operator builds a convex hull. A concave hull probably has no meaning anyway, we must build it by hand. So what's the trick? The expected concave wedge shape can be made by unions of successive hulls! Here is our first attempt at a potential "concave" wedge. It works but it makes a dirty source code (so far). This is how we did it. We also introduces the min(v1,v2,v3..) and max() mathematical operators (weirdly, they do not take a vector as argument but a list of variables). The min and max are required to avoid overshooting the expected wedge angle. Here are the result of the intersection of our wedge and the initial torus, that finally does it. It works! The parametric wedge "sliced" the torus the way we wanted. Note the "missing" part? It is only a rendering issue, see below! 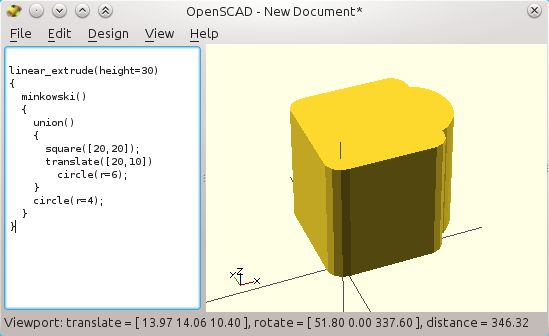 Openscad functions. It helps the renderer by telling to look deeper in the intersection of objects.